Tilly and the Buttons: It's Like Wearing a Quilt! 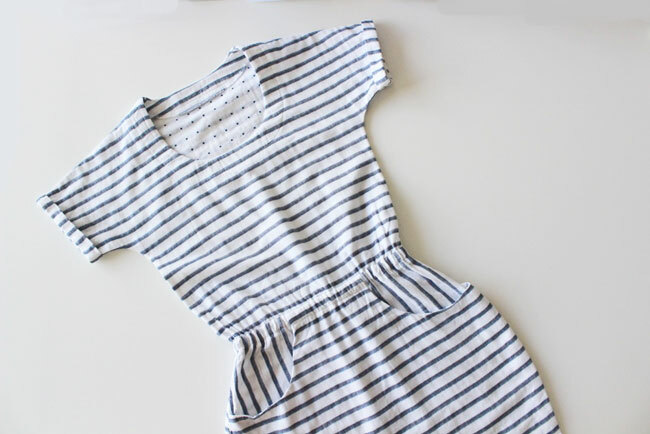 Let's face it, it was only a matter of time before I made a Bettine dress in stripes. This beauty of a fabric has been sitting patiently in my stash for years now, waiting for the right project to come along. It's a soft double gauze that I found a while back on Etsy (alas I can't remember the name of the seller - sorry!). Wearing this dress feels a bit like wearing a quilt - in a good way, naturally. Double gauze, as the name would suggest, is formed of two layers of fine cotton gauze, trapping a teeny bit of air in between. The result is breathable yet snuggly - a winning combination! Because it's not that drapey, double gauze is one of those fabrics that holds the kimono sleeve shape - with loose fabric at the underarms - more clearly than a drapier fabric would. It's what I would categorise as a "modern-utilitarian" Bettine, similar to how it looks in chambray, as opposed to a floaty-feminine one in something like a viscose or poly crêpe de chine - like my sunglasses print Bettine - in which the fabric at the underarms would fall in softer folds. 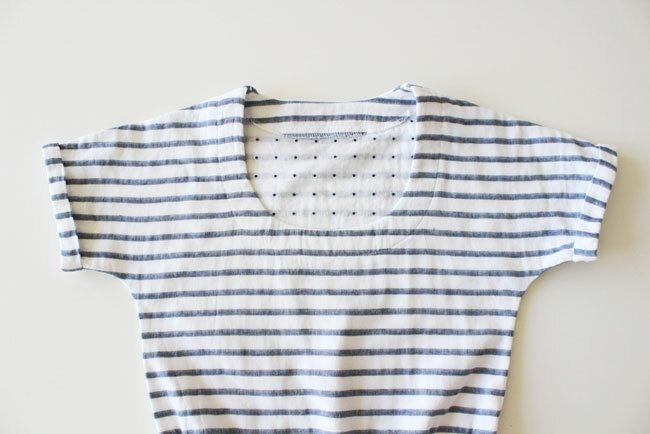 You can see more of what I'm talking about in this post on fabric ideas for sewing Bettine. Japanese manufacturers seem to have a particular penchant for making double gauze (anyone know why? ), so you can find it in some beautiful designs. Fabric HQ, Hart's Fabric, Backstitch and Guthrie & Ghani all have some lovely pieces in at the moment. I cut the pocket bags and pocket facings with the stripes running vertically instead of horizontally - I love the finished effect. When you wear the dress with your arms down, the kimono sleeve design makes it look like the stripes on the sleeves are running vertically too. 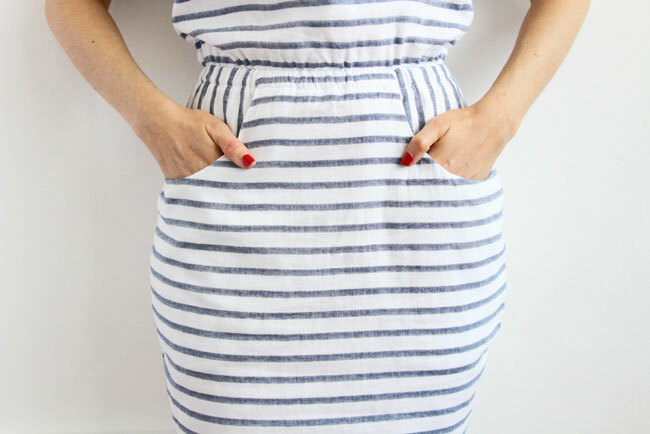 If you're making a stripey Bettine of your own, you could also try cutting the stripes horizontally on the bodice and vertically on the skirt. 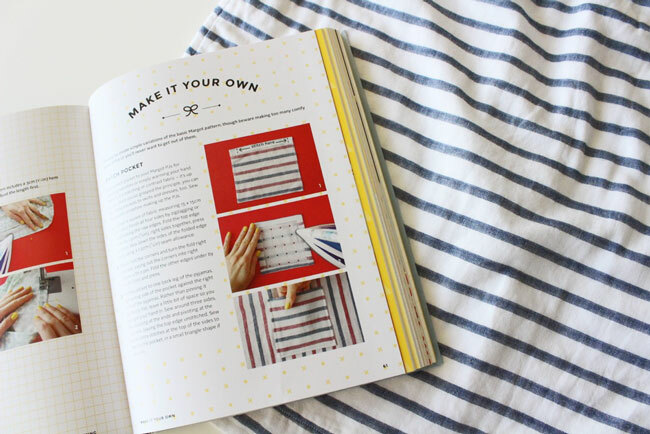 I bought the same fabric in a blue and red stripe too, and made some Margot pyjama bottoms in it - you can see it in my book, on the page about adding a patch pocket. As it's so soft and snuggly, double gauze makes a great choice of fabric for pyjamas - the Fifi sewing pattern is too delicate for double gauze but it makes a great pair of Margot PJs. I've made seven Bettine dresses for myself so far, and this is definitely one of my favourites. It's one of those dresses I'm worried about wearing too much as I don't want it to fade or shrink in the wash or whatever it might one day! 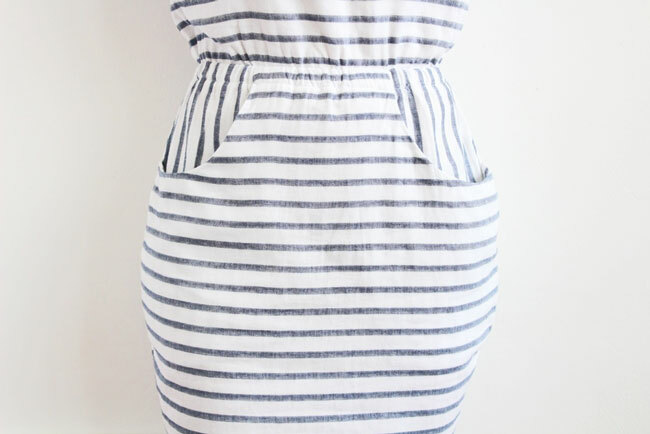 For those of you who saw a work-in-progress snap on Instagram of my jersey Bettine dress, omigawd I love it.. I'll post a full report soon, including changes to make for sewing the pattern in a stretchy knit fabric. Don't forget - we're having a Summer Sewing Instaspam Party this coming Sunday 9 August 2015. Post a pic of your Bettine dress or Fifi set to Instagram or Twitter anytime on Sunday, using the hashtags #sewing and either #SewingBettine or #SewingFifi so we can see it. Search the hashtags to find others at the party, get some sewing inspiration, like their posts, make new sewing friends, and let's have a big love in :) Can't wait to see you at the party!